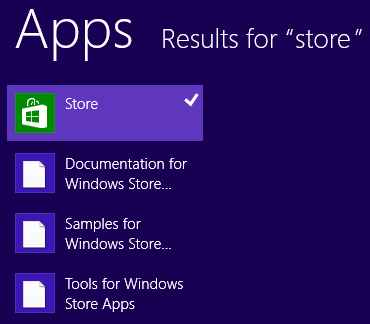 Users can easily delete Windows 8 App Store tile on Start screen and remove Store App shortcut from Start screen. I see that Windows 8 users who deleted App Store tile think that they uninstalled Windows App Store which is normally impossible. So this Windows 8 tutorial will demonstrate how to get the Windows App Store back on your Windows 8 Start screen. First, on Start screen press Windows Key + Q to activate Search charm. Or you can directly start typing the search words "store" on Start screen that will activate Search charm without a short-cut key. If you used Windows 8 shortcut "Windows Key + Q" then when Search charm is displayed, in search box type "store" as search string and press Enter to start search. Results will be listed found related on your computer. Windows App Store is listed in Apps tab in the returned search result set. Press Apps and find Windows App Store in the list. On Store App right click and choose Pin to Start from contect menu to pin Windows App Store tile on Windows 8 Start screen. That is all, now Windows Store app tile is place on Start screen. 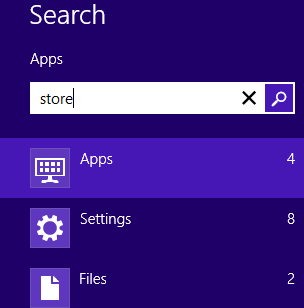 You can locate the Store application tile by drag drop method on any place on Windows 8 Start screen. From now on you can again use your Windows Store App to reach Windows Store to search, download and install apps among thousands.